Cats love to curl up and feel comfortable and warm, particularly in the winter months. This gift could provide one of our feline residents with a fleece blanket to make them feel cosy in their cabins during their stay in our cattery. With this virtual gift, you will receive a certificate to thank you for your generous donation. 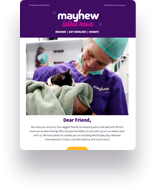 This gift supports our Mayhew Animal Home projects.